What to do, when you don’t know what to do! The theme of this article is Football Clubs however the exact same benefits of cashless environment apply to other sporting venues including but not limited to racecourse, rugby club, motor racing circuit, basketball club, athletics club etc. In fact the German F1 Grand Prix in Nurnberg in 2009, the 2010 Football World Cup in South Africa, the 2012 Olympics in London, 2014 basketball World Cup in Spain have plans for cashless facilities and in the case of the German F1Grand Prix have already implemented a cashless solution. To demonstrate this point Sandra Alzetta, Visa Europe Senior VP for consumer market development, said “the aim is for a cashless Olympic Games in London in 2012”. In recent times we have seen a surge in e-payments or what is now been termed cashless payments, but what is the cause of this gallop towards removing cash from some environments. Well that is simple …..costs savings, revenue generation and efficiencies. There have been many types of organisations implement cashless something or other including Local Authorities, Government, Schools & Universities, Sports Arenas and more. All have realised significant benefits including modest revenue generation but moreover cost reductions and efficiency gains. In fact one local authority have seen 60% increase over all efficiencies by issuing and entitlement card rather than paper vouchers and cheques. The potential for generating revenue in most sectors is, as previously mentioned, modest however not so within the stadia environment where the increase in revenue for a well planned and implemented scheme can be significant. So when that is added to the benefits of holding the deposited funds and having immediate access to the transactional data the attraction for football clubs is very clear. But is this just hype or are the financial benefits of cashless stadia truly a reality? They can be if the scheme is a closed scheme where the cashless solution operates only within the stadium and club shop, and where club is the custodian of the cashless scheme and the funds deposited within it. This type of scheme could be managed by the club directly or the club could appoint a specialist organisation to manage the scheme on their behalf whilst retaining the overall control. This approach vastly improves a business case based on income and also gives the club a direct relationship with the supporter and autonomy over the day to day operation of the cashless scheme including the all important scheme rules, in particular the breakage rules. How the cashless scheme is perceived by the supporters will be the critical success factor in terms of customer experience for every Cashless Stadia scheme. So in the closed scheme operated by the club, the fans are truly supporting the club on many fronts not just from the terraces and with the right scheme rules the club is directly responsible for the relationship with the supporters. If, however, the club outsource the whole cashless process to a third party then almost all of the financial benefits disappear along with the direct relationship with the supporter, but this does fit with a business case built around streamlining operations to just core functions. Control over the scheme operation and rules have also been passed to the third party supplier. Also depending on the contract terms data sharing may also be less than ideal. Transactional data is extremely important for providing the club with the ability to dynamically create personalised promotions and offers to the supporters via CRM. If data is not available on demand then selling those surplus XXXL away shirt in April will be more of a blunderbuss rather than sniper approach. On the face of it giving away all this control to a third party is not the best approach, correct? Well that depends on what the club actually have a set of requirements. If the clubs view is that they are in the business of playing football and achieving success on the pitch, and the operational cost of a cashless solution within their stadia is a necessary evil, then outsourcing the complete scheme is exactly the right thing to do. However if the aim is to be able to efficiently manage and nurture the relationship with the supporter whilst generating additional income from intelligent but uncomplicated use of the transactional data, then outsourcing the whole cashless scheme would be madness. The decision to go cashless either completely or in just one section of a stadia is not an easy one to make and must be done after properly analysing the clubs overall objectives and other considerations such as the contractual arrangements with other suppliers such as caterers etc. Then and only then can and informed decision be made for a best fit solution and how it should be implemented to ensure the highest rate of customer delight and take up is achieved. Cashless Stadia, what are the benefits? Regardless of whether the clubs chooses to retain control of their cashless scheme or outsource to a third party what cannot be disputed are the common benefits. No cash handling – there will be no cash transactions within the stadium on match days, no cashing up, no more security van collections. Faster throughput – because a cashless transaction is up to can be 60% faster than cash and 3 times faster than a credit and debit transaction the queues at the catering kiosks move much more quickly. Improved hygiene – as the catering staff will not be handling cash and only handling food this not only removes any related hygiene issues but also enables fewer staff deliver a faster more efficient service. Free pricing – there is no reason to keep prices to round 50p or pound so this enables an item of £2.50 be increased to improve revenue or decreased which will improve customer experience and may lead to higher sales. Improved data – the transaction data via the POS terminals can tell who bought what, when and where in the ground which can be used in personalised promotions when processed through CRM. The specific benefits of either a closed scheme that the club operates directly or via a specialist organisation and those of a fully outsourced scheme should be carefully considered. What to consider when choosing a cashless solution! Systems integration i.e. which systems. 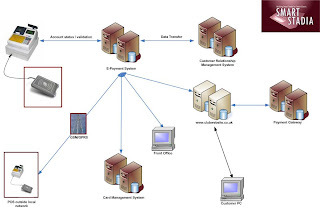 Point of Sale (POS), Customer Relationship Management system (CRM) as a minimum and also a Card Management System (CMS) for the more progressive multi-application smartcard schemes. Customer communications / Promotion of the scheme. Watch out for that banana skin! Technical – the danger is to get hung up on the technical details, and this could be fatal for the day to day scheme operations. Cashless solutions interfaced with a variety of other systems built with a wide range of technologies exits today in many different markets and industry sectors so whilst this may be new to sports stadia it is not for education, university campus, large business premises, theme parks etc. Basically the technology works so clubs should choose the suppliers and then let them do what they are being paid and are well qualified to do. That is not to say that suppliers should be given the requirements and left to get on with it as a consistent level of effective supplier management should be applied throughout the life of the implementation. If clubs focus too much on the technical side, whilst it wont be the first time, this will cause sight to be lost of the back office processes. This will undoubtedly result in messy and expensive manual workarounds once the scheme is in operation. Data – another potential pit fall is data. What will be captured and why? What will / can be done with it once it is captured? What data will reside on the card, system, account? Moreover what data does the club currently have that will enable customer accounts to be set up and is it clean. No matter how hard any organisation may try a percentage of the existing data will be inaccurate. The important thing is to be prepared for that and have a good plan to avoid bad publicity especially around the deceased and those under the age of consent. Legal and Regulatory – most important of all the potential banana skins is legislation and industry standards & regulations. In the UK the Financial Services Authority (FSA) should be consulted for advice on any cashless solution. They will almost certainly want to review the monitoring systems in place for schemes under the SeMIC rules and this can take up to 6 months to achieve certificated status. Their legal speak is often confusing so consider enlisting the help of and experienced consultant with a sound understanding of the FSA regulations and a good relationship with the FSA. This will help avoid delay and expense during the application process and prevent the risk of the scheme application failing or worse, allow a situation to arise that could cause the club to be liable for hefty financial penalties. Also be mindful of up coming regulations and legal changes such as the Payment Service Regulations of 2009 and the new e-Money Directive which comes in 2011. In modern day Europe PrePaid debit cashless payment is the fastest growing payment method and the chart below demonstrates this. It is important to understands that the customers of football clubs are already using cashless prepaid as a payment method with other service providers, mobile phone top-ups, smart utility meters, parking, vending, public transport are just a few examples. So… the of concept prepaid payment is not a new one for football supporters. The financial benefits to the club and the improvement in the customer experience can be very significant, not to mention the power that having the transaction data can give a club. The benefits and advantages of a carefully planned and implemented cashless solution in a football club are clear to see, and in most cases the implementation costs could be recouped inside 1 maybe 2 seasons. The longer it takes to make the decision the longer it will take to realise those benefits and advantages. 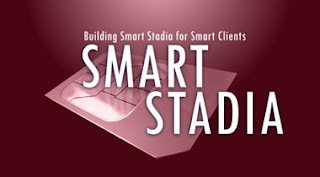 The author, Steve Beecroft is a smart technologies consultant with Smart Stadia which is a division of Consulting Smart Ltd. Mr. Beecroft founded the company in September 2006 to meet the needs of clients within local authorities and financial services sectors. Since their start, Consulting Smart Ltd. has expanded into the sports stadia area with Smart Stadia and are already working with several English Football League Clubs. Smart Stadia has extensive experience in solution and service integration relating to smart technologies within stadia. They offer their clients advice from concept and feasibility through to design planning, build, implementation, and benefits realisation. Smart Stadia is based in Brighton, UK. For further information, telephone their offices on +44 (0) 208 123 0811 or contact them via email at info@smartstadia.com.